With increasing demand being placed upon material purity, the STADLER ballistic separator is the ideal machine for cleaning up paper and plastics. 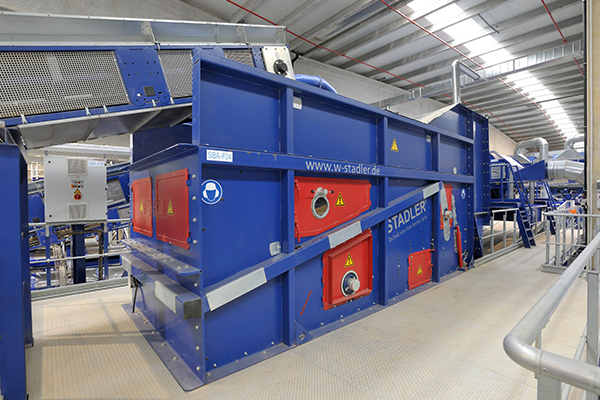 With more than 750 ballistic separators sold to date, STADLER is one of the worldwide market leaders for these low maintenance machines. The ballistic separator operates on the principle of six or eight inclined screening paddles that rotate offset from each other. This allows for trouble free sorting of materials into three different fractions, without the downtime associated with disc screens. The machine works by allowing rolling and heavy materials, including hollow bodies, plastic bottles, stones, wood, cans and steel sections to be dropped out towards the low end of the screening deck. Flat and light materials, such as paper and cardboard, are transported upwards. The screened fraction allows for various sizes to be separated with the paddle perforation. In the case of paper, this can significantly reduce any residual glass. One of the key features includes patented pivoting frame with tilt adjustment, meaning there is no need to tilt the entire machine. Another key feature is optimal material distribution to any subsequent optical sorting machines, such as near-infrared sorters, while bolt-on screens can be replaced individually. The machine also features dirt and wrapping protected shafts, large maintenance openings – both above and below the working area and stadler patented stacking function that facilitates multi-level sorting of different particle sizes.